Registration is open for ClickerExpo Luminos 2019! Registration is now open for ClickerExpo Luminos 2019! Join us 25-27 Oct 2019 in Cheshire, UK. Limited spots available! ClickerExpo is coming to Seattle, WA January 10-12, 2020 and Louisville, KY March 13-15, 2020! Registration will open in August. Sign up for our events newsletter to be among the first to hear about all things ClickerExpo! Choose from immersive 5-Day courses or 2-Day seminars at our National Training Center in the Seattle/Tacoma area. Learn more. Courses for aspiring and experienced trainers. Teach your dog how to tell the difference between left and right … or large and small! 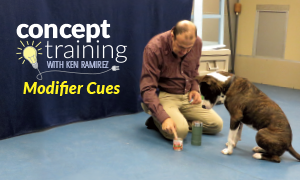 In Concept Training: Modifier Cues, Ken Ramirez shows you step-by-step how to train the concept of modifier cues. 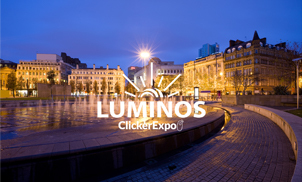 Join us for ClickerExpo Luminos 2019! Limited spots available for ClickerExpo Luminos 2019! Join us 25-27 Oct 2019 in Cheshire, UK. Become a certified trainer, attend ClickerExpo, and take advantage of business resources. Locate a certified trainer that you and your pets can count on. Learn the basics of clicker training and how it can help you raise a great pet. Everything you need to get started clicker training your new puppy, adopted dog, or older dog! You'll see a difference in your dog in just a few short sessions! The choice of the next-generation training tool has never been clearer. 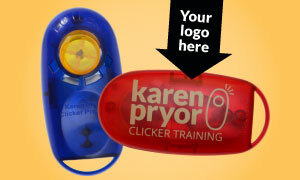 The original i-Click™ was developed by the clicker trainers at KPCT to be revolutionary in design and function. The Balance Harness is designed to fit any dog's individual body type while providing comfort, complete freedom of movement, and flexible leash-attachment options.